Our inboxes in January are overloaded with motivational messages, pinging at you like a hyperactive personal trainer: Lose weight! Get fit! Stop smoking! Start training! Write that book! Sort out your money! However much we try to respond to them, it’s hard to make it through the month without suffering from Good Intention Overload. And by now, as we near the end of January, the best of intentions are already beginning to slip – and each time they do, a little bit of our belief in ourselves slips with them. In my work I advocate a calmer, gentler approach to achievement: small, practical actions that create something real. The key is scaling down intentions to a manageable level and keeping intentions and actions close together. One of my clients had grand plans for her garden. Every year, she would draw up diagrams and planting schemes, returning from the garden centre full of ideas and laden with packets of seeds… which never actually got planted. Last year, she decided to concentrate on the one thing she wanted most from her garden. She scaled it right down to a tub of rocket. This time she bought and planted the seeds, watered them every now and then and was rewarded with many months of rocket, and many moments of delight nipping out to pick fresh leaves as she made packed lunches in the morning. Those few real, peppery plants tasted a whole lot better than the produce of all the imaginary raised beds. If you consistently don’t do what you say you’ll do, you’re drip-feeding yourself the message that you cannot keep your resolutions, that you’re not to be trusted. 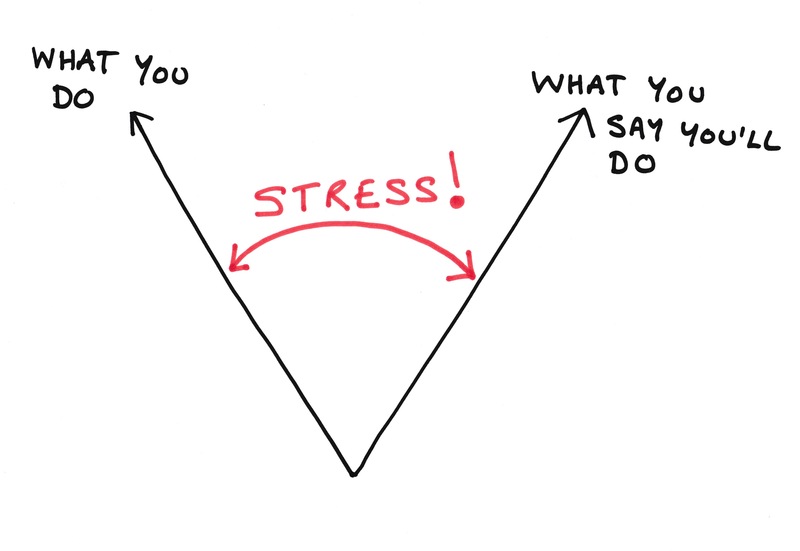 The wider the gap between your intentions and action, the greater the stress. Try easing up on the intentions and jumping straight into the actions. I’ve been working with the Do Something Different team for some years now, more recently helping them create one of their Do Something Different programmes (one all about money behaviours), and I’m convinced and inspired by the philosophy of changing behaviour through action. There is, of course, a chicken and egg relationship between mindset and behaviour: a change in attitude or beliefs can result in very real behavioural changes. Yet all too often there’s a frustrating and bewildering gap when understanding and awareness take big leaps ahead, while behaviour lags behind. There is an astonishing power to be harnessed by simply doing something different, rather than thinking or learning or reading about it. It gives you undeniable proof to yourself that you can do it: because you just did. 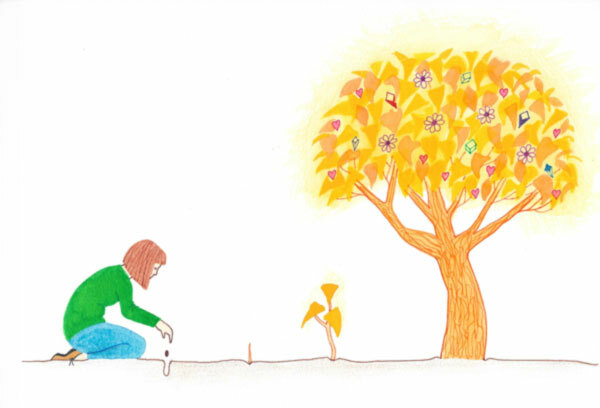 The start of a new year is an ideal time for sowing seeds: do something small and real, that will then carry on and keep growing by itself (with just a teeny bit of attention every now and then) to come to fruition. What’s one small thing you could do today that will reward you in future? What is your financial equivalent of that tub full of rocket? Perhaps you could set up text alerts on your bank account? It only takes a few minutes to do this yet could mean not wasting your cash this year on unplanned overdraft fees. Or automate something such as overpaying your mortgage, or a paying into an ISA or pension? Maybe set up a direct debit into a smoothing account or a savings account for the thing you want most – a holiday this year? You could sow seeds of new habits by writing money meetings with your partner into this year’s diary. Or put your online banking before social media on your toolbar – encouraging you to check this first. New habits take a bit more maintenance than once-off actions, but can grow and develop into feelings of control and capability around finance. Don't forget to also check out Do Something Different and their Do Money programme which will provide you with your own set of small, simple actions to help you change your relationship with money. Whatever you do, the repercussions of constant small successes create an upward spiral of confidence that lead to growth and blossoming far beyond the particular goal or intention. That’s a great strategy Tanya - paying yourself first!